fBiogen Idec Inc. (J.A.P. ), Weston, Massachusetts. BACKGROUND AND PURPOSE: Pathologic changes in GM have an important role in MS. We investigated the association between SDGM and cortical volume changes and disability progression in early RRMS. MATERIALS AND METHODS: One hundred eighty patients with RRMS had clinical assessment during 5 years and were divided into those with or without SDP at 5 years by the usual definition in treatment trials. The number of available MR imaging scans at various time points was the following: at baseline, 178; and at 6 months, 172; at 12 months, 175; at 24 months, 155; at 36 months, 160; at 48 months, 158; and at 60 months, 162, respectively. Longitudinal changes in cortical, GM, and WM volume were calculated by using the direct method. RESULTS: At 5 years, 90 patients with RRMS experienced SDP and 90 had stable disease. At baseline, patients with SDP had longer disease duration, greater T2-lesion volume, and smaller whole-brain, WM, cortical, and SDGM volume (P < .01). At 5 years, patients with SDP had significantly greater percentage decreases from baseline compared with those without SDP in the volume of the whole brain (P < .0001), cortex (P = .001), GM (P = .003), and thalamus (P = .01). In patients who developed SDP at 5 years and those who did not, mixed-effect models, adjusted for age, disease duration, and change of the treatment status, showed significant interactions between SDP status at 5 years and changes with time in whole-brain, cortical, lateral ventricle (all P < .001), thalamus (P = .006), and total SDGM (P = .0095) volume. CONCLUSIONS: SDP is associated with progression of cortical, central, and thalamic atrophy in early RRMS during 5 years. structural image evaluation with normalization of atrophy. It is likely that GM pathology reflects increased cortical and SDGM damage and atrophy, which may also underlie other aspects of MS-associated disability.1⇓–3,7,8 Several case-control studies have established that SDGM but not cortical atrophy is present at the earliest clinical stages of the disease.16⇓⇓⇓–20 Other studies indicate that damage to the SDGM is associated with memory impairment.21,22 However, to date, there have been no long-term longitudinal studies investigating possible associations among SDGM, cortical atrophy, and disability progression in RRMS. The aim of the current study was to monitor the temporal dynamics of SDGM and cortical atrophy in patients with early RRMS who participated in an intramuscular interferon β-1a study during 5 years and to determine any association with disability progression. The study was approved by the Medical Ethics Committee (Charles University of Prague and University of Buffalo). All MR imaging assessments were performed by using the same Gyroscan 1.5T scanner (Philips Healthcare, Best, the Netherlands). Axial images of the brain were obtained by using FLAIR with 1.5-mm section thickness and axial T1-weighted 3D spoiled gradient-recalled images with 1-mm section thickness. Both images had an in-plane resolution of 1 × 1 mm. All images were nongapped. MR imaging assessment protocols were conducted as reported.12,27 Investigators performing the image analyses were blinded to subject characteristics and clinical status. T2-lesion volume was calculated by using a reliable semiautomated edge-detection contouring/thresholding technique previously described.28 With FMRIB's Linear Image Registration Tool software (FMRIB; http://www.fmrib.ox.ac.uk/),29 all follow-up FLAIR images for a given subject were coregistered to his or her baseline FLAIR image by using a 6 df rigid-body model. All subsequent lesion analyses were performed by using the coregistered images. For each follow-up time point, T2-lesion volume was performed via the aid of a “subtraction image.” Briefly, the FLAIR image from the previous time point was subtracted from the corresponding current FLAIR image. The result was then smoothed with a Gaussian kernel of σ = 0.5 mm. Cross-sectional ROIs were overlaid on the subtraction image to facilitate the identification of a new T2-lesion volume. Global and Tissue-Specific Atrophy Measures. For longitudinal changes of the whole-brain volume, we applied the SIENA method31 to calculate the percentage brain volume change. To quantify longitudinal GM, WM, and cortical and lateral ventricle percentage volume changes, we used a modified hybrid of SIENA and SIENAX in FMRIB. We used a brain- and skull-constrained coregistration technique to place both baseline and follow-up images into a position half-way between the two. As in the original SIENA method,31 this helps minimize a potential bias by subjecting both images to the effects of coregistration. Next, we combined baseline and follow-up intracranial volume masks via union and valid voxel masks via intersection, ensuring that the same imaging volume was analyzed at both time points. Finally, we segmented the resulting images with a modified longitudinal version of FMRIB's Automated Segmentation Tool (FAST),32 which uses a 4D joint hidden random Markov field to prevent misclassification between time points when longitudinal intensity changes are lacking (or minimal). Total tissue volume was calculated for both baseline and follow-up for each tissue compartment from partial volume maps, and percentage volume change was derived directly from the images. The 5-year evaluation of the associations between SDGM, cortical atrophy measures, and disability progression was preplanned. Because neither the 2-year27 nor the 5-year6,12 nor the 6-year34 results showed any statistically significant differences between the treatment groups, the groups were merged for the purpose of the current analysis. For the present analyses, patients were divided into 2 groups based on disability progression. The first group contained patients who, at the end of the 5-year period, had SDP. This was defined as any 1.0-point sustained (24-week) increase in the EDSS score in patients who had a baseline EDSS score of ≥1.0 or any ≥1.5-point sustained (24-week) increase in the EDSS score in patients who had a baseline EDSS score of 0.0. The second group contained subjects without SDP who were patients with stable disease. Patients who completed the 2-year study and did not enter the 3-year extension period or who had discontinued treatment for reasons other than disability progression underwent scheduled follow-up evaluations. Because early study enrollment resulted in a total observation period of >5 years for some patients, data were not censored at 5 years; therefore, any patient reaching sustained progression after 5 years was categorized as having “progressed” at year 5. Comparisons were made between SDP and stable MS. Comparisons at baseline were performed by using the Pearson χ2 test for categoric values and the Student t test or Wilcoxon rank sum test for continuous variables with a skewed distribution. Regression analysis at 5 years for absolute and percentage change from baseline variables was used to adjust for differences in baseline age, disease duration, and change of treatment status during the 5-year follow-up. Temporal changes in global, tissue-specific, and deep gray matter MR imaging measures by disability-progression status at different time points of the study are shown as mean ± 95% confidence intervals and median ± interquartile range, as appropriate. Longitudinal linear or quadratic random-intercept mixed-effect models,35 adjusted for baseline age, disease duration, and change of treatment status during the 5-year follow-up, were used to describe the temporal associations between SDGM and cortical atrophy along with other MR imaging measures and disability progression. Variables violating normality assumptions were transformed by using Box-Cox transformations for modeling purposes. To avoid too many spurious findings due to multiple comparisons, we have not reported anything as statistically significant unless the nominal P value was ≤.01 by using 2-tailed tests. In total, 180 patients with RRMS (90 patients each in the SDP and stable disease groups, according to the 5-year classification) were included in the study. The disability progression status was captured for all 180 patients at 5 years. The number of available MR imaging scans at various time points was the following: at baseline, 178, and at 6 months, 172; at 12 months, 175; at 24 months, 155; at 36 months, 160; at 48 months, 158; and at 60 months, 162, respectively. The missing scans at various time points were due to the unavailability of MR imaging scans or failure of accurate quantitative analysis (data not shown). The observed patient populations with MR imaging data at 5 years exhibited no statistically significant differences in baseline demographics or clinical or MR imaging characteristics compared with those with missing MR imaging data at 5 years, except for a trend toward a treatment switch (P = .019, data not shown). Tables 1 and 2 present baseline characteristics for the 180 evaluable patients. Clinical and MR Imaging Outcomes at Baseline. Comparisons between the MS groups showed that patients in the SDP group had a longer disease duration (P = .01) than patients with stable disease (Table 1). Additionally, patients with SDP had a greater T2-lesion volume (P < .001) as well as a smaller total SDGM volume (P = .002), whole-brain volume (P = .003), normalized WM volume (P = .007), and normalized cortical volume (P = .01) (Table 2).There were no significant differences between the 2 patient groups in baseline EDSS score and normalized lateral ventricle or normalized GM volume. With the exception of the caudate (P = .001) and thalamus (P = .002), the SDGM brain structures measured were not significantly different at baseline between the 2 groups (Table 2). Clinical and MR Imaging Outcomes at Year 5. At 5 years, the mean EDSS was 3.2 in the SDP group and 1.6 in the stable group (P < .001). Comparisons of percentage change from baseline to 5 years in MR imaging outcomes are shown in Tables 3 and 4. The percentage change in whole-brain volume was greater in patients with SDP than in stable patients (−4.8% versus −2.6%; P < .001; Fig 1). Additionally, there was a significant interaction effect in the mixed-effect model analysis with disability progression and percentage change in whole-brain volume with time (interaction P value < .001) showing patients with disability progression having a steeper decline (Fig 2). Temporal changes in global and tissue-specific MR imaging measures by disability-progression status at different time points of the study are shown as mean ± 95% confidence intervals and median ± interquartile range, as appropriate. A, Percentage change in whole-brain volume. B, T2-lesion volume. C, Percentage change in lateral ventricular volume. D, Percentage change in cortical volume. Changes in global and tissue-specific MR imaging measures (fitted values–intercept model) by disability-progression status with time. Percentage change in whole-brain volume: interaction P < .001 (A); and T2-lesion volume: interaction P = not significant (B). C, Percentage change in lateral ventricular volume: interaction P < .001. D, Percentage change in cortical volume: interaction P < .001. Significantly greater percentage volume change in the cortex (−5.4% versus −3.8%, P = .001) and GM (−5.3% versus −3.8%, P = .003) was detected in patients with SDP than in stable patients (Table 3 and Fig 2). There was a significant interaction effect in the mixed-effect model analysis, with disability progression and percentage change in cortical (interaction P value < .001) but not total GM volume with time, showing patients with disability progression having a steeper decline (Fig 2). At 5 years, a significantly greater decrease in thalamus volume (−6.2% versus −4.5%, P = .01) was detected in patients with SDP than in stable patients (Fig 3). When we detected changes in slope over the entire study period, thalamus and total SDGM volume showed significant decreases with time in patients with SDP compared with stable patients (thalamus interaction P value = .0006 and total SDGM volume interaction P value = .0095; Fig 4). Temporal changes in deep gray matter MR imaging measures by disability-progression status at different time points of the study are shown as mean ± 95% confidence intervals and median ± interquartile range, as appropriate. Total deep gray matter volume (A) and thalamus volume (B). Changes in deep gray matter MR imaging measures (fitted values–intercept model) by disability-progression status with time. Total deep gray matter volume: interaction P = .0095 (A); and thalamus volume: P = .0006 (B). The SDP group exhibited a significant increase with time in lateral ventricle volume (interaction P value < .001) compared with stable patients (Figs 1 and 2). During 5 years, no significant difference in accumulation of T2-lesion volume was detected between stable patients and those with SDP (Figs 1 and 2). This study is the first prospective, longitudinal, long-term investigation of the association between the SDGM and cortical atrophy accumulation with disability progression in patients with early RRMS. At the end of the 5-year observation period, retrospective analyses of baseline characteristics and MR imaging assessments were performed to compare patients who developed disability progression with patients whose disease remained stable. Most interesting, the baseline MR imaging assessments gave an indication of patients who would progress because these patients had significantly greater T2-lesion volume and significantly smaller whole brain, WM, total SDGM, caudate, and thalamus volume. In the previous preliminary analysis of the 5-year data,12 no difference in baseline whole-brain volume or normalized WM volume was found between patients who progressed or those who remained stable after 5 years. This could have been related to the fewer patients and the shorter time period used for the definition of the SDP group in the previous study.12 In addition, a newer version of the SIENAX (2.6) and an improved in-painting method were applied in the current study, which could have contributed to better accuracy of the results. After adjusting for age, disease duration at baseline, and change of treatment status during 5 years, we saw significant interactions with time and disability progression with whole-brain volume and cortex, lateral ventricles, thalamus, and total SDGM volume, suggesting that the association with disability progression and deterioration on these MR imaging structures is predictive and time-dependent. We performed this study as an exploratory one, and given the paucity of data, we did not know how many comparisons we would make a priori; thus, we did not adjust the significance tests for multiple comparisons. Potential associations identified in the current study may drive future research with preplanned analyses to validate the results of this exploratory research. As expected, MS patient groups exhibited substantial decreases in whole-brain volume and corresponding increases in lateral ventricle volume during 5 years. This finding is in line with those of previous studies.36 Previous clinical studies in MS have shown an association between whole-brain atrophy and an increases in lateral ventricle volume and have found that both measurements were associated with increased disability.37,38 This association was confirmed in an earlier analysis of data from part of this cohort,12 which showed that whole-brain volume was predictive of disability progression. Of particular note in the present study was the increase in lateral ventricle volume during 5 years, which was >10% greater in patients with SDP than in stable patients. Among the patients with MS, more SDGM atrophy was seen in patients with SDP than in stable patients, most likely as a result of the significantly greater decreases in thalamus volumes in the former group. Because previous study showed age-dependent atrophy in the thalamus in healthy subjects,39 age was retained in all analyses, as a covariate. The findings from the current study suggest that SDGM structures are severely affected in the first 10 years of disease after clinical onset. The potential relevance of SDGM atrophy to the development of disability progression was shown by the significantly smaller volumes at baseline in patients with SDP. The largest longitudinal difference during 5 years between the SDP and stable MS groups was detected in the thalamus (1.7 percentage points), which has a role in regulating a wide variety of functions, including receiving input from other SDGM structures and relaying neural signals to the motor cortex.40 The results from our study suggest that SDGM and, in particular, thalamus atrophy in MS may affect areas of the brain that are important for the control of motor functions. Patients with SDP showed more advanced cortical atrophy at 5 years compared with stable patients. This was confirmed by the mixed-effect-model analysis, which found an interaction with time. These findings are in agreement with those in previous studies that have suggested differential patterns of GM and WM atrophy during 2 years for patients with MS versus healthy controls6 and that the rate of GM, but not WM, atrophy increased with advancing disease stage and was correlated with disability.4,5,12,24,25 Fundamentally cross-sectional approaches like SIENAX are still widely used to measure GM and WM changes,25 leading to potentially less accurate results and more analysis failures. Direct measures of cortical, GM, and WM volume changes with advantages similar to those of SIENA have been lacking. We built on the basic half-way-registration and scaling-factor estimation components of SIENA. In addition, we modified FAST to incorporate a fourth dimension in its hidden Markov random field model, to directly represent time. Like SIENAX, the output provides individual cortical, GM, WM, and lateral ventricle volume but with significantly reduced classification errors between time points. The SDs of longitudinal percentage-volume changes with our approach (Table 3) are substantially lower than those found in previous studies measuring GM and WM changes with time.4⇓–6,12 Therefore the robust findings between patients with SDP and stable patients for 5 years in the present study may be related to the new longitudinal direct way of performing calculations for the evolution of cortical, GM, and WM volume changes. Albeit not significantly different, of interest were changes in WM volumes between patients with SDP and stable patients during 5 years (Table 3). There was almost a 1% WM volume decrease in the SDP group and a 0.4 increase in the stable group. This finding suggests that development of WM atrophy may also play an important role in disease progression. The proposed direct measurement approach of brain tissue compartments in this study improves on the standard SIENAX technique and may provide more precise data and additional statistical power for studies evaluating cortical, GM, and WM atrophy changes with time. Placebo-controlled clinical studies have shown that intramuscular interferon β-1a slows disability progression,41 reduces T2-lesion volume,42 and prevents atrophy.23⇓⇓–26,43 Despite these known effects of treatment with intramuscular interferon β-1a, both patients with SDP and those with stable MS exhibited loss of brain tissue during the course of this study. The extent of atrophy in untreated patients with MS is likely to be greater than that observed in the treated patients in this study, though it is not known whether the differential pattern of WM and GM atrophy would be as evident. Our study confirmed previous reports from this cohort that showed that accumulation of T2-lesion volume did not influence disability progression during the long term.6,12,44 During the course of the study, no significant difference in the evolution of T2-lesion volume was seen in the stable group compared with the SDP group. 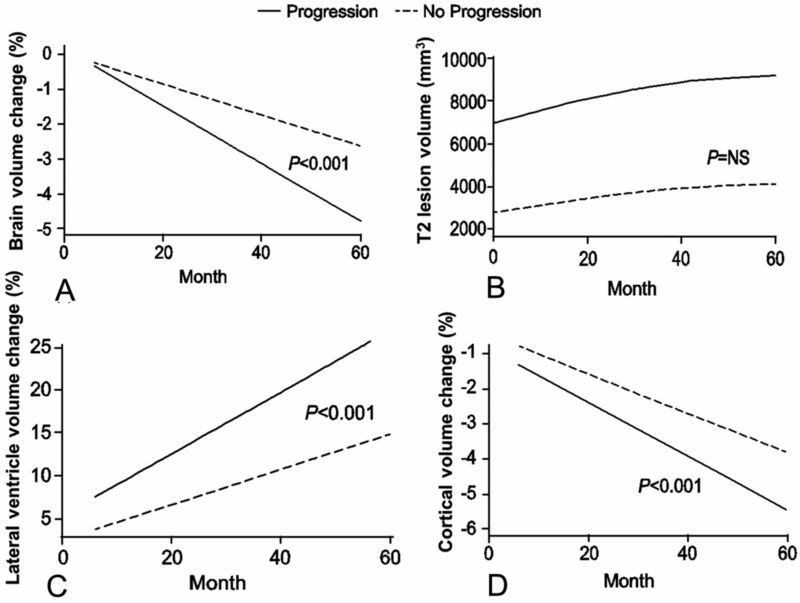 However, the baseline T2-lesion volume was substantially larger in the SDP group. In the original 2-year ASA study, the percentage of T2-lesion volume change at 2 years was significantly lower for the combination (+14.5%) versus interferon β-1a alone (+30.3%) group.27 However, in a most recent 6-year follow-up evaluation of the ASA study by the original treatment arm,34 it was reported that no significant difference in the absolute T2-lesion volume and its changes during 6 years was seen between the original treatment groups. 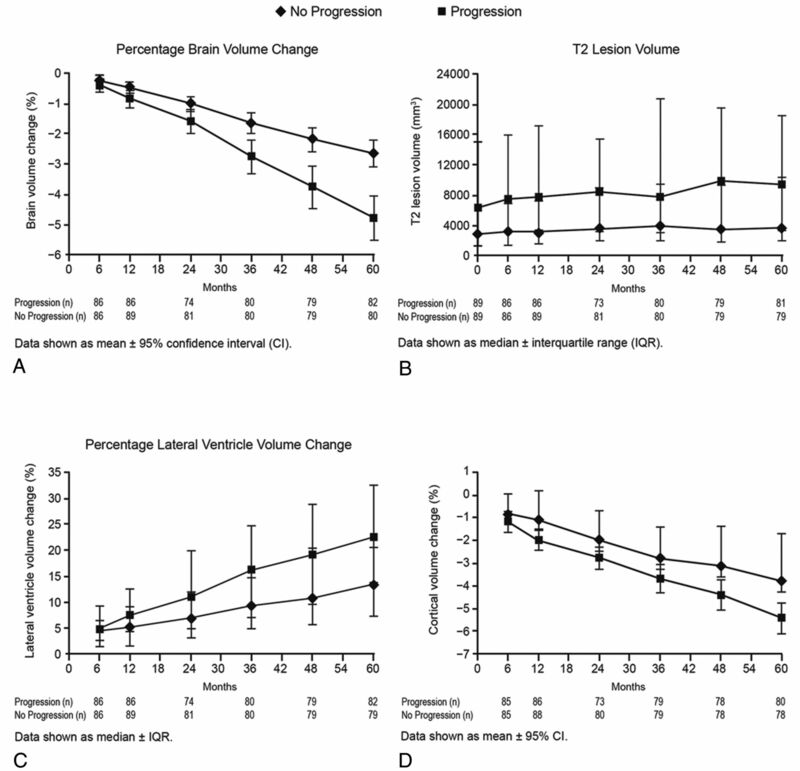 These additional data suggest that the original percentage changes of T2-lesion volume differences were probably inflated by the lower baseline T2-lesion volume in the interferon β-1a-alone group. Our findings suggest that changes in cortical, thalamus, and central atrophy occur early in the MS disease course, particularly in patients who are likely to have more rapid disease progression. Greater decrease of thalamus and cortical percentage volume change during the first 10 years of the disease influenced disability progression as measured by the EDSS, in addition to being evident already early in the disease process. Although it is currently not possible to accurately identify patients who will have a more aggressive disease course before the manifestation of clinical symptoms, our findings indicate that measurement of thalamus and cortical atrophy, even in early-stage patients, may have future potential in predicting the disease course. Further studies are required to expand on these findings, particularly in those patients who have progressive disability associated with cognition, either with or without ambulatory problems. The authors thank all patients who participated in this study and Eve Salczynski for technical assistance in the preparation of this manuscript. Disclosures: Robert Zivadinov—RELATED: Grant: Biogen Idec,* Czech Ministry of Education,* Provision of Writing Assistance, Medicines, Equipment, or Administrative Support: Writing support was provided by Infusion Communications and was funded by Biogen Idec Inc. The authors were not compensated and retained full editorial control, UNRELATED: BMC Neurology, Consultancy: Teva Neuroscience, Biogen Idec, EMD Serono, and Questcor Pharmaceuticals, Grants/Grants Pending: Biogen Idec,* Teva Neuroscience,* Genzyme,* Bracco,* Questcor Pharmaceuticals,* EMD Serono,* Payment for Lectures (including service on Speakers Bureaus): Teva Neuroscience, Biogen Idec, EMD Serono, and Questcor Pharmaceuticals. Niels Bergsland—RELATED: Grant: Czech Ministry of Education,* Biogen Idec,* Comments: This study was supported by the Czech Ministry of Education, Research Program MSM0021620849, PRVOUK-P26/LF1/4, RVO-VFN64165/2012, and Biogen Idec Inc, Provision of Writing Assistance, Medicines, Equipment, or Administrative Support: Writing support was provided by Infusion Communications and was funded by Biogen Idec Inc. The authors were not compensated and retained full editorial control. Ondrej Dolezal—RELATED: Grant: Biogen Idec,* Czech Ministry of Education,* UNRELATED: Consultancy: Sanofi Aventis, Grants/Grants Pending: Biogen Idec, Travel/Accommodations/Meeting Expenses Unrelated to Activities Listed: Biogen Idec. Zdenek Seidl—RELATED: Grant: Czech Ministry of Education (RVO-VFN64165/2012),* Other: Biogen Idec, Comments: financial support for research activities. Michael G. Dwyer—RELATED: Grant: Czech Ministry of Education,* Biogen Idec. * Manuela Vaneckova—RELATED: Grant: Czech Ministry of Education (RVO-VFN64165/2012),* Other: Biogen Idec, Comments: support for research activities. Jan Krasensky—UNRELATED: Support for Travel/Accommodations/Meeting Expenses Unrelated to Activities Listed: Biogen Idec. James A. Potts—UNRELATED: Employment: I am a full-time employee of Biogen Idec. Tomas Kalincik—RELATED: Grant: Czech Ministry of Education (MSM0021620849),* Fees for Participation in Review Activities such as Data Monitoring Boards, Statistical Analysis, Endpoint Committees, and the Like: Biogen Idec, Provision of Writing Assistance, Medicines, Equipment, or Administrative Support: Biogen Idec,* UNRELATED: Employment: Multiple Sclerosis Research Australia, MSBase Foundation, Comments: postdoctoral fellowship, Grants/Grants Pending: Czech Ministry of Health;* Travel/Accommodations/Meeting Expenses Unrelated to Activities Listed: Novartis, Biogen Idec, Sanofi Aventis, Teva, Merck Serono. Eva Havrdová—RELATED: Grant: Czech Ministry of Education,* Biogen Idec,* Comments: Projects of Czech Ministry of Education: MSM0021620849, PRVOUK-P26/LF1/4, RVO-VFN64165/2012; MRI acquisition: Biogen Idec, UNRELATED: Consultancy: Biogen Idec, Merck Serono, Novartis, Genzyme, Teva, Grants/Grants Pending: Biogen Idec,* Merck Serono,* Payment for Lectures (including service on Speakers Bureaus): Biogen Idec, Merck Serono, Novartis, Genzyme, Teva. Dana Horáková—RELATED: Grant: Czech Ministry of Education,* Comments: Research Program MSM0021620849, PRVOUK-P26/LF1/4, RVO-VFN64165/2012, Consulting Fee or Honorarium: Biogen Idec, Other: Biogen Idec, Comments: support for research activities, UNRELATED: Consultancy: Biogen Idec, Novartis, Merck Serono, Bayer Shering. *Money paid to the institution. Writing support was provided by Infusion Communications and was funded by Biogen Idec Inc. The authors were not compensated and retained full editorial control. The Avonex-Steroids-Azathioprine study is an investigator-initiated study that was supported by Czech Ministries of Education and Health (NT13237-4/2012, MSM 0021620849, PRVOUK-P26/LF1/4, RVO-VFN64165/2012). The MR imaging acquisition part of the study was supported by Gedeon Richter and Biogen Idec. Accepted after revision December 5, 2012. Optimal MRI Sequence for Identifying Occlusion Location in Acute Stroke: Which Value of Time-Resolved Contrast-Enhanced MRA?